One Little Lamb bamboo insert, made from 100% Oeko-tex yarn. Available in 3 sizes. This bamboo insert is designed to fit inside the Littlelamb Sized pocket nappy but works just as well in the OneSize, or any other brand of similar nappies. It's made from 100% Oeko-tex yarn and is woven rather than knitted to keep the bulk down. 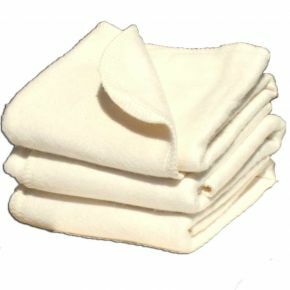 They are three times as heavy as the standard bamboo booster and absorb three times the quantity of fluid. Being woven, and not knitted, they will shrink up to 10% in size after the first few washes but that doesn't effect the efficiency. They come in three sizes..